Whether you are looking to make your school grounds more wildlife friendly, create an outdoor classroom, build a sensory garden or make a Forest School area, we are excited to help you transform your school grounds! 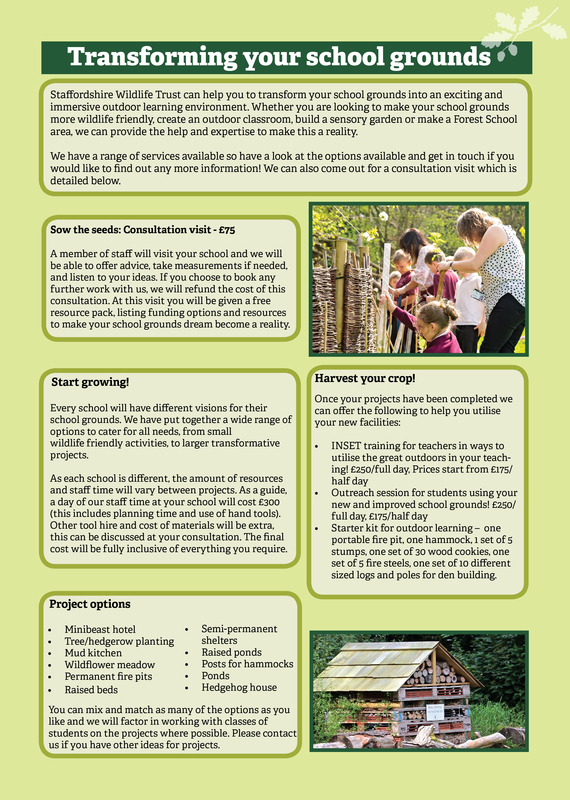 Find out more about involving the whole school in creating a space for nature that everyone can enjoy. Staffordshire Wildlife Trust can help your school or community group to create a space for nature that everyone can enjoy. You might want to make an outdoor classroom area, create a wildlife pond or wildlife garden, plant some trees or build some woodland sculptures. Whatever your vision is, we can guide you through the process - and help get pupils, parents, staff and community volunteers involved in everything from design through to creation. We have a range of services available – check out our options, decide on what is suitable for your school and your needs, and get in touch – our experienced officers will be on hand to make your project a reality! Initially, a trained member of staff will visit your school and talk to the staff in charge of the project for a consultation fee of £75. We will be able to offer advice, take measurements if needed, and listen to your ideas and requirements. If you choose to book any further work with us, we will refund the cost of this consultation. At this visit you will be given a free resource pack, listing funding options and resources to make your school grounds dream become a reality. Every school will have different visions for their school grounds. We have put together a wide range of options to cater for all needs, from small wildlife friendly activities, to larger transformative projects. You can mix and match as many of the following options as you like. We know that it is important to include students in the planning and creation of outdoor learning spaces, and so we will be able to factor in working with classes on several of these projects. All prices are subject to change. As each school is different, the amount of resources and staff time will vary between projects.